As a lover of good wine residing in South Australia and regularly visiting New Zealand, and therefore thoroughly spoiled with an endless supply of great wines, it was time I reminded myself of other iconic wine regions in Australia. So I visited the Yarra Valley. Not only was I not disappointed but I was blown away by the high standard and classic winemaking mentality of the wineries I visited. Being a long-time wine lover it is that bit more impressive for a wine to amaze you. In the Yarra Valley I was like a kid again, consumed with wonder and delight. Our little group of wine tourists consisted of ten people on a minibus driven by Barry of Chillout Wine Tours. 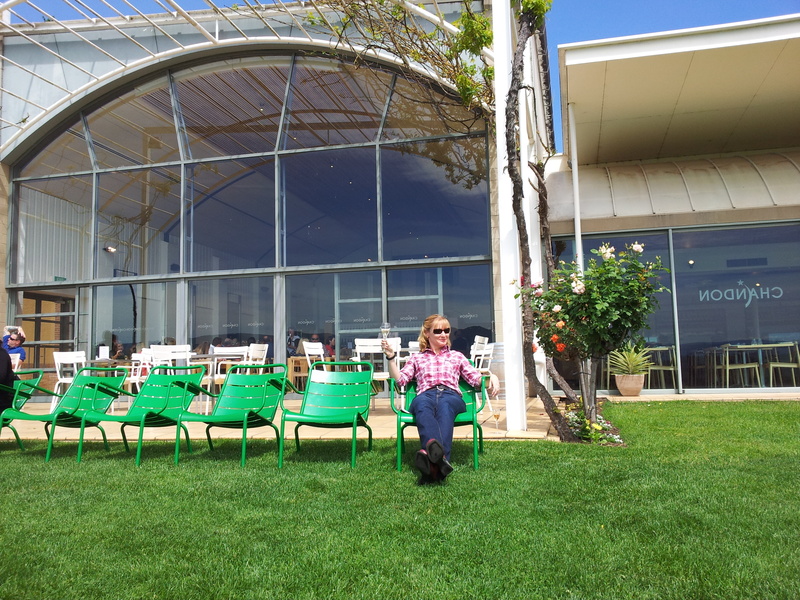 Tigs enjoying a glass of bubbles at Chandon – comfy chairs too! We had a welcoming glass of bubbles at our first stop – the prestigious and world class Chandon of the Moët and Chandon group. What an incredibly beautiful place – I recommend you clicking the Chandon link to see the 360 degree view of the cellar door and surrounding vineyards and lake. We kicked back and savoured the traditional method 2008 vintage and the rosé. Relatively dry with about 7 grams of residual sugar and true class to match the French champagnes. On to Train Trak – a much smaller winery, making stunning chardonnay and consistently good quality wines including a moscato and a shiraz. I am not a moscato drinker generally, preferring a drier wine, but this was fresh and lifted with pretty fruit and with a cleansing palate. Delicious. Then onto the winery that exuded that wow factor in every wine – Yering Station. Most wineries have some good wines. At this winery all of them were excellent. The Yarrabank sparkling is a national favourite, deservedly so. I adored the 2005 chardonnay – and was rewarded with a taste of the even more spectacular 2010 reserve chardonnay – elegant, soft and complex, and proof of Australia’s enduring ability to produce world class chardonnay. The pinot noir was equally elegant and rewarding – savoury, long, and proof that the Yarra Valley is a pinot force to be reckoned with. The sangiovese was exceptional – savoury, bursting with flavour, long and supple. Even the rosé impressed me – with zero grams of residual sugar it was bone dry and perfect for my taste. Of course the shiraz viognier, the flagship wine of Yering Station, lived up to its reputation, as I knew it would (I have had a sneaky few tastes in the past!). What impressed me most about Yering Station was the philosophy of the winemaking, going back to letting the grapes speak and the winemaker interprets. Furthermore, chief winemaker Willy Lunn’s stated philosophy is “no compromise for quality”, born from his days at Petaluma in South Australia under winemaker Brian Croser, where he worked for 15 years. The wines were all impressive and jumped this winery right up into my top five Australian wineries. I will wax lyrical about these wines for ever more! And did you know? The first vineyard in Victoria was planted at Yering Station in 1838. The last stop on our trip was the world famous De Bortoli – their Noble One botrytis semillon never ever fails to delight – delicious drops of intense sunlight in a glass, full bodied, funky, luxurious. Mmmmmm!!! No wonder it has a cult following. And finally a shout out to all the staff who served us at these four wineries – all friendly, helpful and informative. Yarra Valley has left a very sweet taste in my mouth – even the wines with no residual sugar! This entry was posted in Chardonnay, New World wine, Pinot noir, Sangiovese, Syrah/Shiraz, Wine events, Wine news and tagged Chandon, chardonnay, De Bortoli, Train Trak, Yarra Valley, Yering Station. Bookmark the permalink. 4 Responses to Chill out and get serious in Vic’s Yarra Valley! Wow, a great number of posts I’m reading through are auto produced crapola. It is great to find a piece of writing that isn’t and actually provides me with some sound information I can utilize. Book-marked for later! Many thanks!